Everyone is invited to the meeting at Camrose Public Library 6-8 pm. We hope to see you! i. Camrose Police Service representatives and City of Camrose Strategic planners will be in attendance to ask for our honest feedback on what they are doing well and how they can improve in the future. They are asking for honest and open conversation about this. 1. What aspects of public safety and policing are going well in Camrose? 2. What areas of concern could be improved and/or use increased attention from police and the community? iii. If you cannot attend the meeting, or if you prefer you may submit your responses to police@camrose.ca prior to March 11. 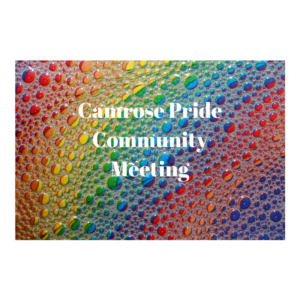 If you wish to submit them anonymously, you may email camrosepridecommunity@gmail.com and we will not reveal your identity when we share your comments at the meeting. b. March 23 All Ages and Stages Dance and Cabaret at Retro 7-10 p.m. (all ages) and 10-? (adults only) Tickets can be purchased in advance at Retro and Quantum Comics and at the door. Space is limited. c. BBQ in June? Planning committee? 7. espressOUT on March 25 5:30-7:00 p.m. Where should we hold espressOUT in March? The Forum? Off campus in a coffee shop? Where? 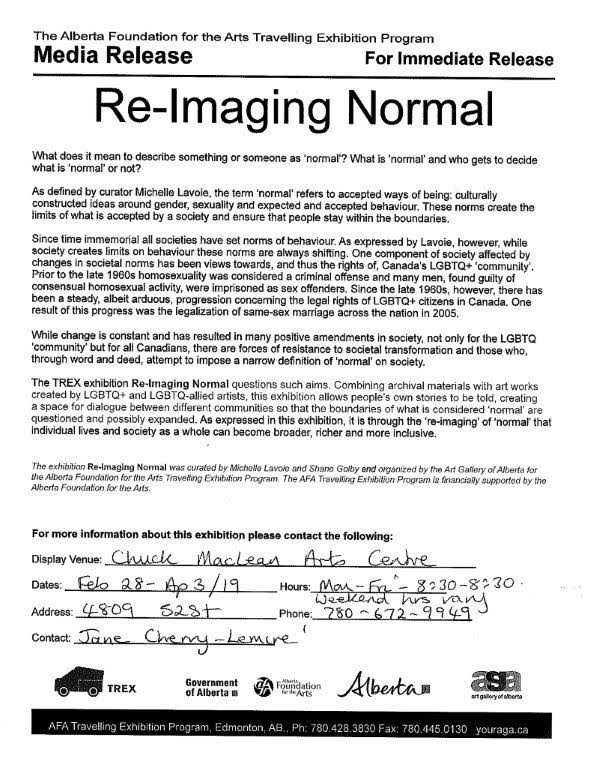 Check out the Queer Like Me Art Show at Camrose Public Library and the Re-imaging Normal Show below! 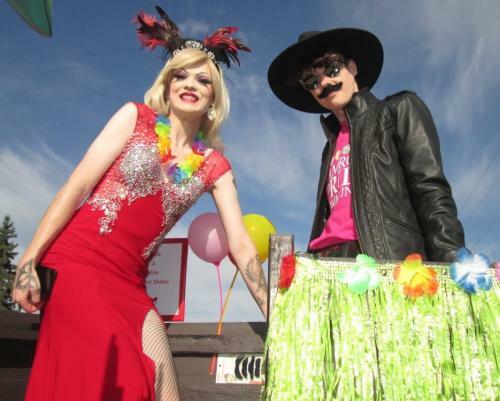 If anyone has other items to be added to the agenda, contact the leadership team at Camrosepridecommunity@gmail.com. 5. Other items or ideas? Community BBQ on June 24, 2018 at House of Hair Design 1-4 p.m. Blanket Exercise with Roy and Judy Louis on September 28 @ 10:30 a.m. and 1:00 @ Camrose Public Library. This is Orange Shirt Day! Blast off to Summer BBQ – June 24? Those of you who preregistered for the Expressive Arts Workshop tonight will be meeting at 6:30 p.m. at Camrose United Church in place of our regular monthly meeting. If you have any questions, text or call Jen at 780-298-4362 . Sorry for any inconvenience changing our meeting may cause.